A traditional event — competition much like the Wing Rodeo I wrote about last week — only different. 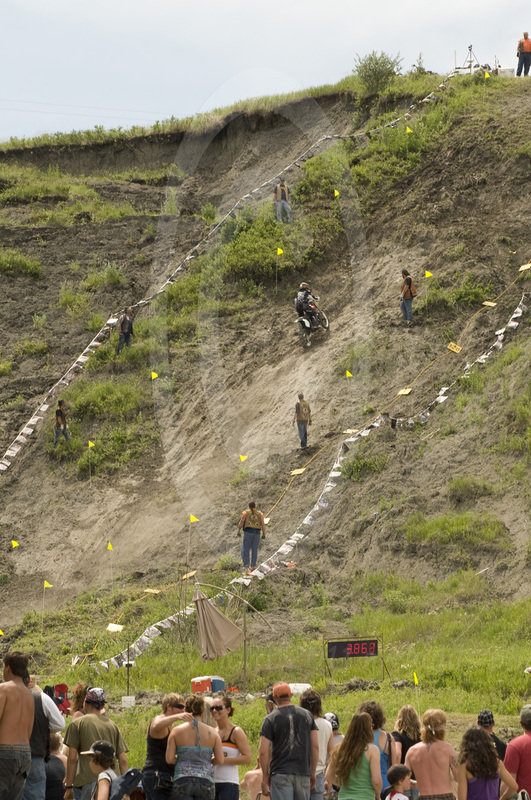 The annual Father’s Day Hill climb by the Dakota Riders at Valley City pits local riders against each other and nature — in this case, a hill. The goal for the smaller bikes is to see how far up the hill they can get. 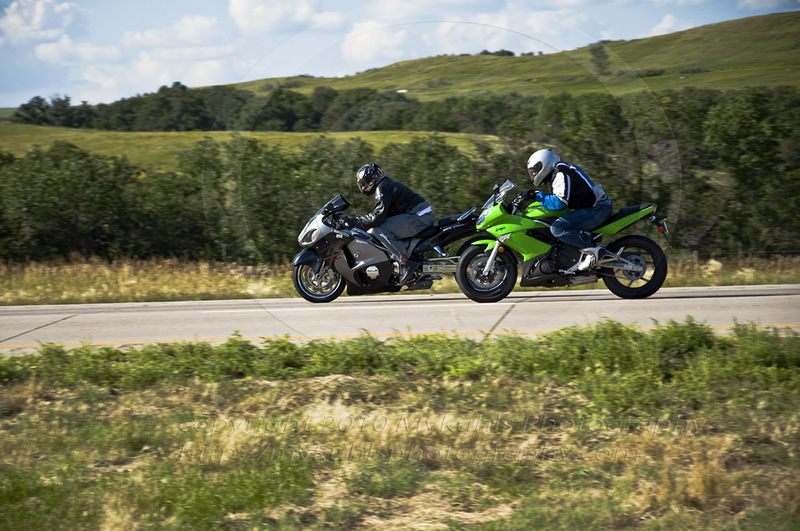 The larger more powerful bikes challenge each other to get to the hill the fastest. In all cases, it’s man and machine against nature — this hill. 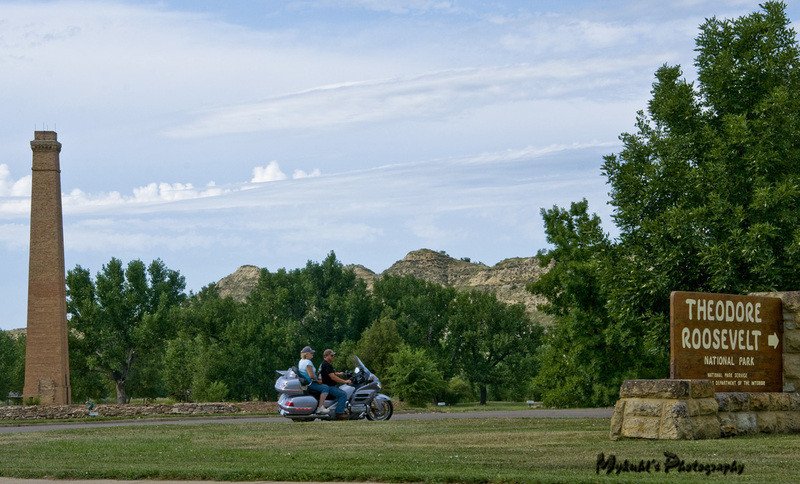 It’s a subculture of note, these North Dakotans who gather at the base of the hill to socialize and to watch the events. 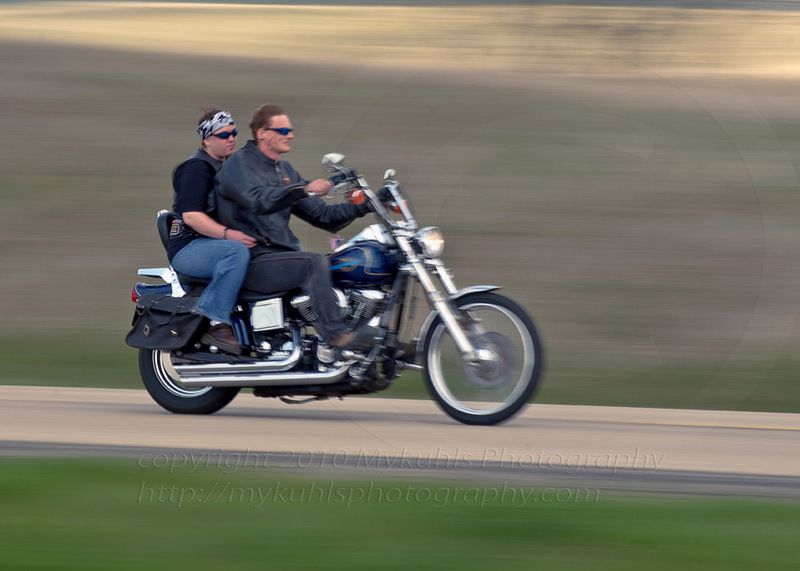 They share a commonality of a love of motorcycles and the motorcycle lifestyle. But that’s about where it ends because they come in all sizes and shapes. Still, a warm Sunday afternoon, good people good entertainment and good competition make the Fathers Day Hill Climb one of my annual events. I used to shoot the competition and that only. 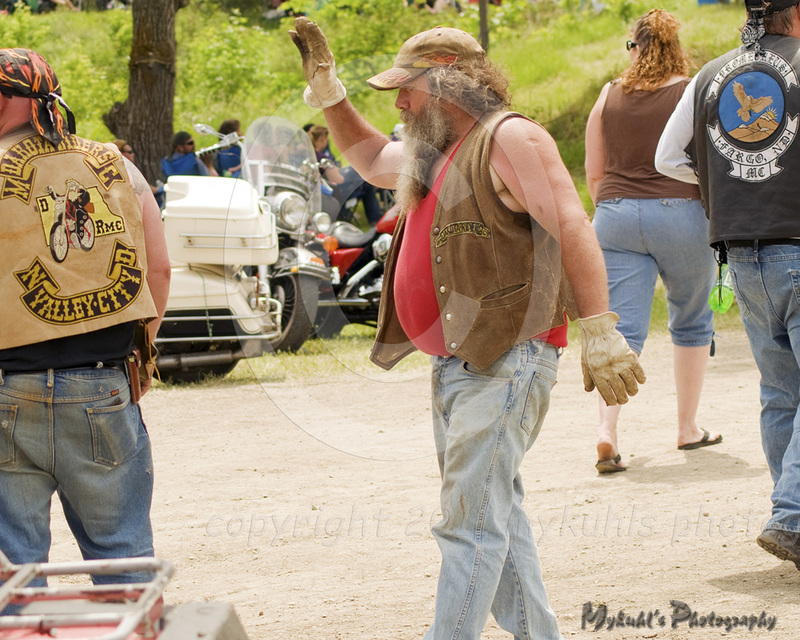 Now I see there’s a whole lot more to the event, and that’s the people, and in some cases the motorcycles. 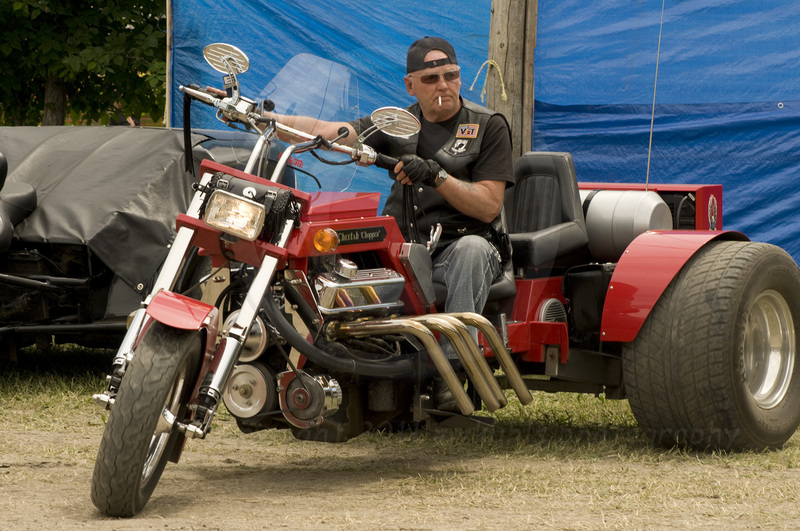 It’s not a drunk fest like some motorcycle events, it’s much more family oriented so there are plenty of good photo ops. Sometimes I think as a photographer I forget to look at the whole picture. I get so focused I miss the best stories to be told by photo — the people and the crowds. 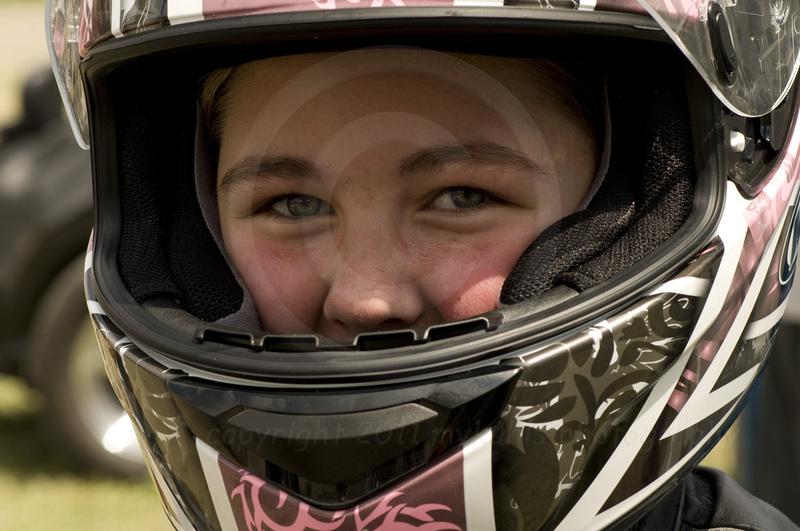 Have you been there to the Hill climb? Hold on to your hat, helmet or headrag. 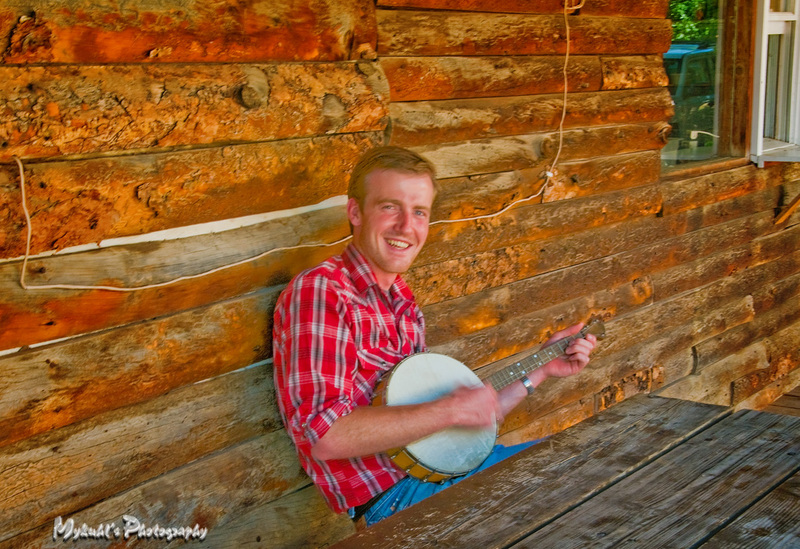 This blog is visual trip across western North Dakota. 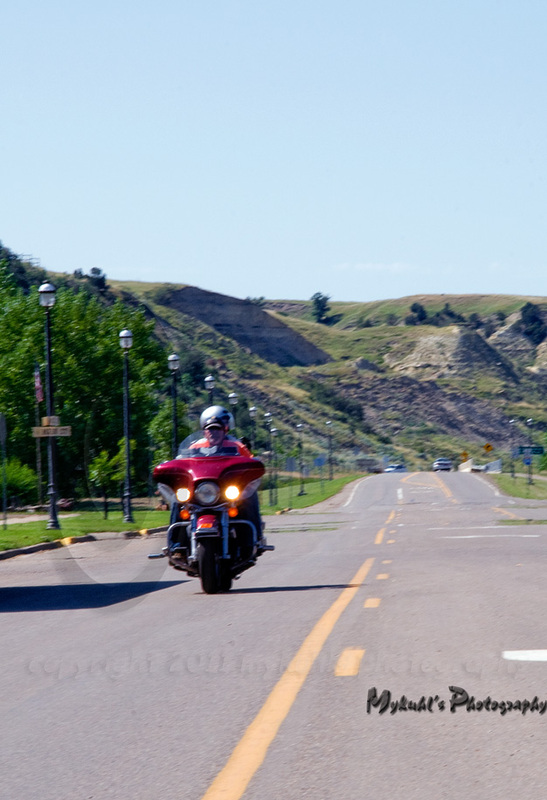 If you are a motorcyclist who is used to riding through and in lots of traffic, you would love North Dakota’s motorcycling, especially west river North Dakota. 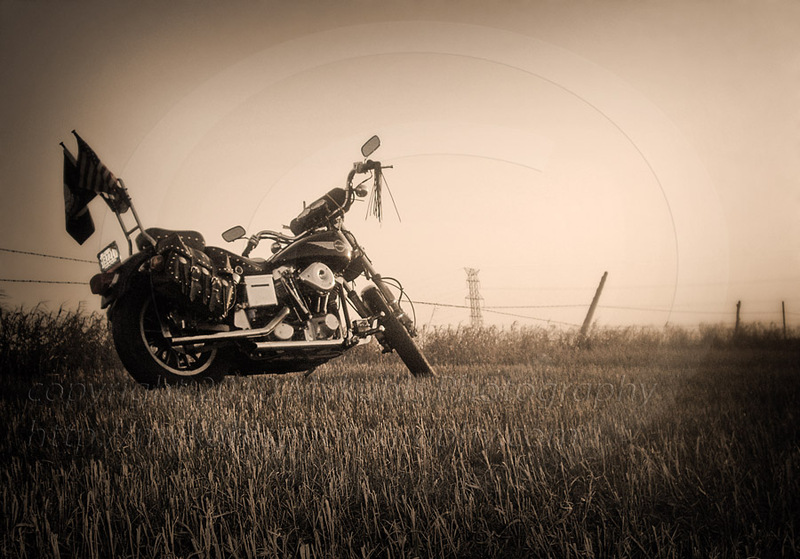 I followed I-94 across the state for a photographic entry in to my other blog 2wheels2lanes1camera. It was a great day to show what North Dakota looks like this time of year, a perfect entry for North Dakota 365. 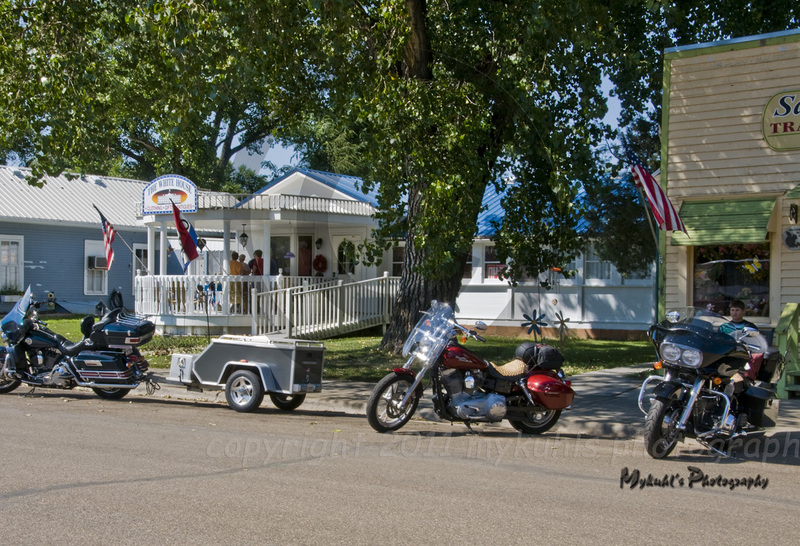 From the outskirts of Mandan where “west river” begins, motorcycles are numerous. 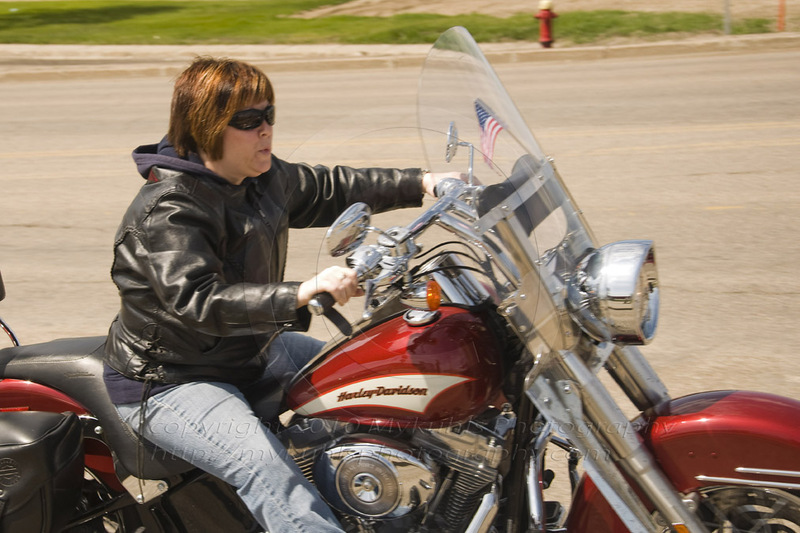 Near the city, sport bikes or “crotch rockets” are plentiful, speeding down the smooth concrete ribbon of Interstate 94. I’m certain you’ll find more pickup trucks with one passenger headed down the highway than any other form of transportation, but it sure seems to me that it makes more sense to take advantage of North Dakota’s wide open spaces to conserve gasoline, leave a smaller carbon footprint and enjoy the ride on two wheels at 45 mpg than to hurl your pickup down the road on four wheels at 12 mpg. 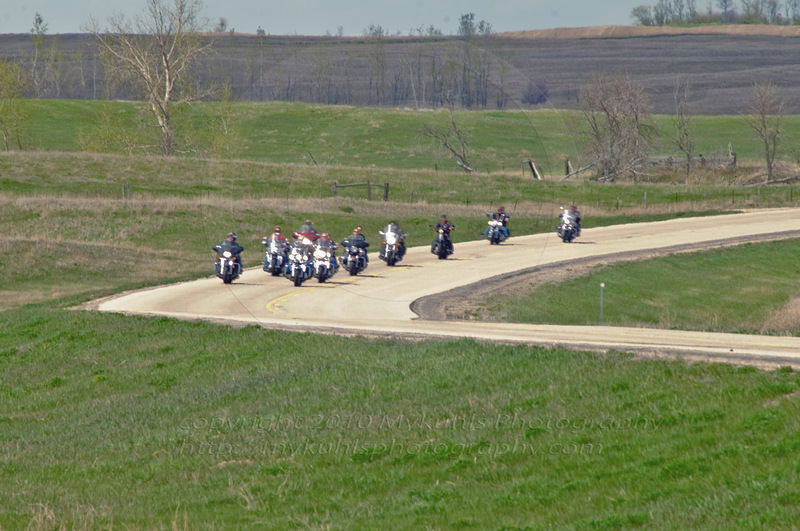 So, if you’re headed across North Dakota, don’t be surprised if you see more motorcycles than you expect. 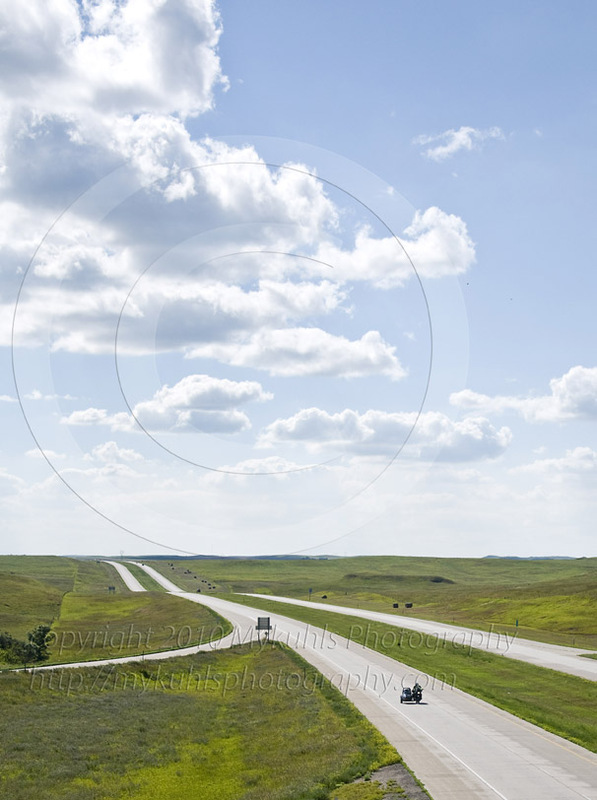 North Dakota is a motorcycle haven of wide open vastness. 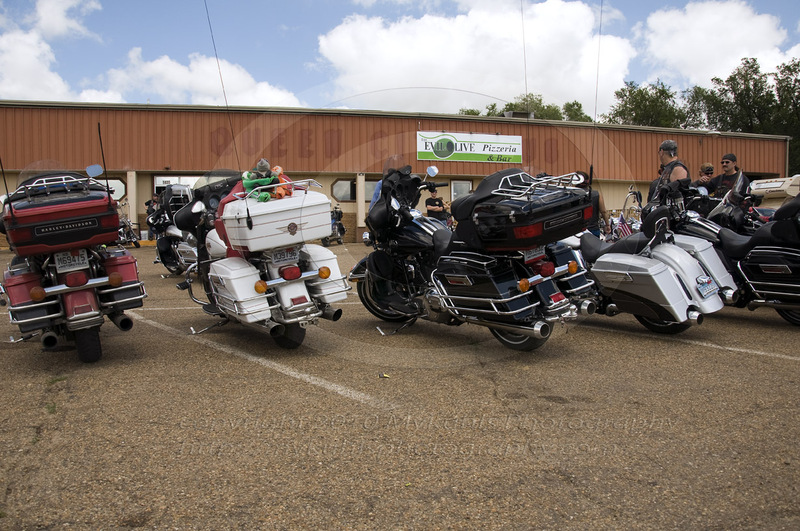 What would it take to get you to ride across the state with me? 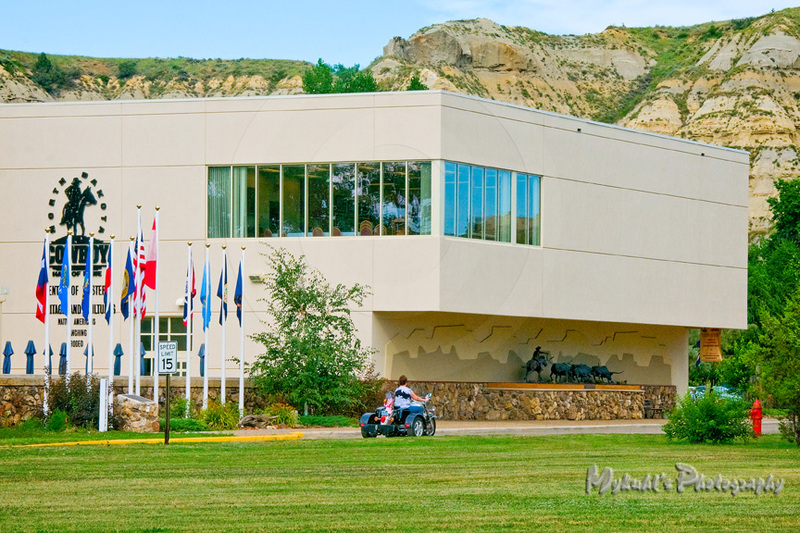 I can only imagine what motorcycle travel was like 40 years ago, heading north along the Missouri River. 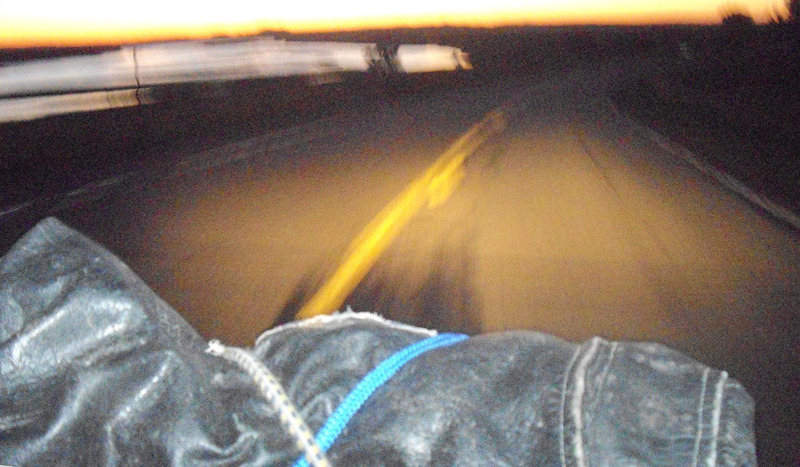 I was riding my 1978 HD superglide with that vibratory shovelhead engine, heading north up River Road, or State Hwy 1804. Years ago, this was a good road by travel standards. 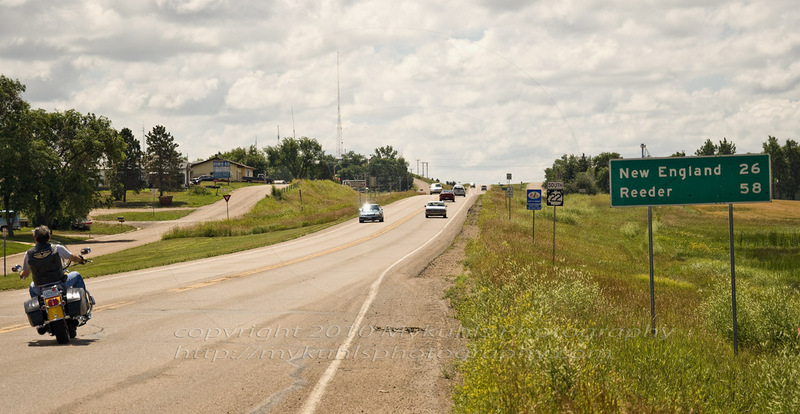 A few miles to the east was federal highway 83, a more straight shot from Bismarck to Minot. On this night, I had left a weekend-long party north of Bismarck. It was dusk and I wasn’t real comfortable with the ability to see deer crossing the road as they do at this time of day. My headlight on that old bike isn’t very powerful. Still it represents some of the best riding a person could have enjoyed in the 1970’s. It was a warm night, so I didn’t need to wear my leather jacket. That’s it bungeed to my handlebars on the bottom of the image. 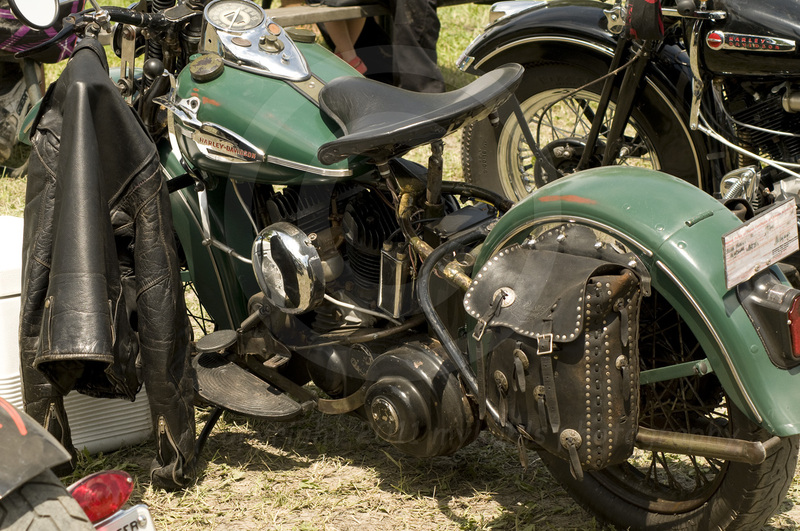 In the 70’s few bikes had windshields and a rolled up sleeping bag or jacket did a noticeable (though not “good”) job of breaking the wind and deflecting bugs up over the head of the rider. That’s still the way I ride. On the way back to Bismarck from the Twin Buttes Powwow, I drove through Golden Valley, North Dakota. A remarkable family tradition of a different kind is enshrined just off Main street. There the Lindemann’s have invested themselves in restoring and maintaining a bit of history. 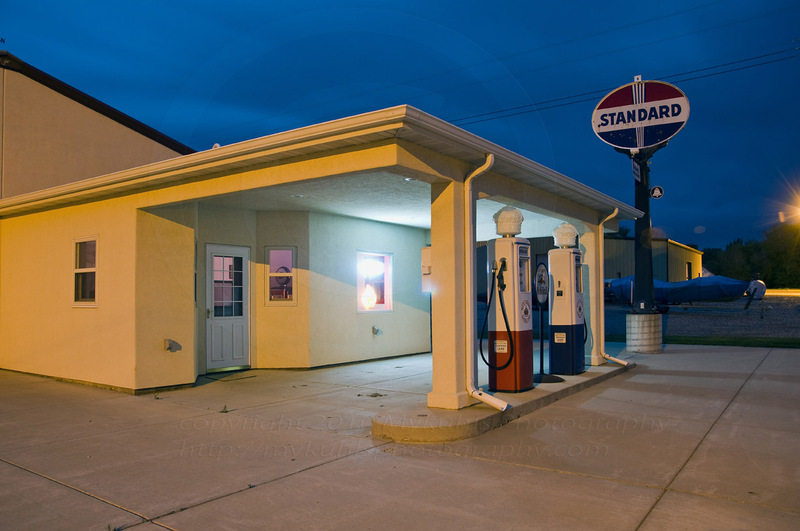 This Standard Oil gas station is actually the entrance to a private Harley-Davidson Museum. Neatly displayed inside the museum is at least one Harley-Davidson from every year of production — and each one runs, ready to be rolled out on the street of John chooses. John Lindemann inherited his father’s love of meticulous restoration. His father, Bill restores old Model As and Model Ts to running and operating perfection. 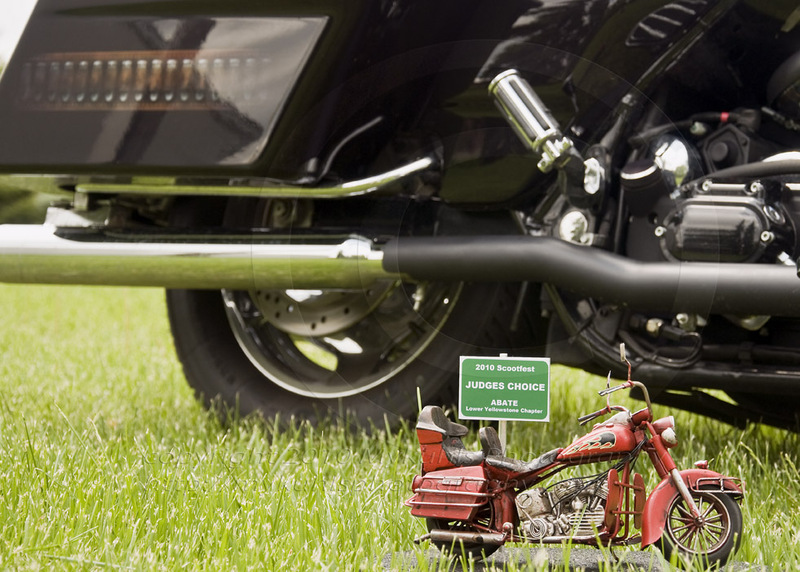 It wasn’t too long ago that the pair would be seen putting down some back road to a car show or motorcycle show in Canada or the West Coast to display their work and take home accolades. Their attention to detail is evident with the effort put in to just the front door entrance to their private museum. 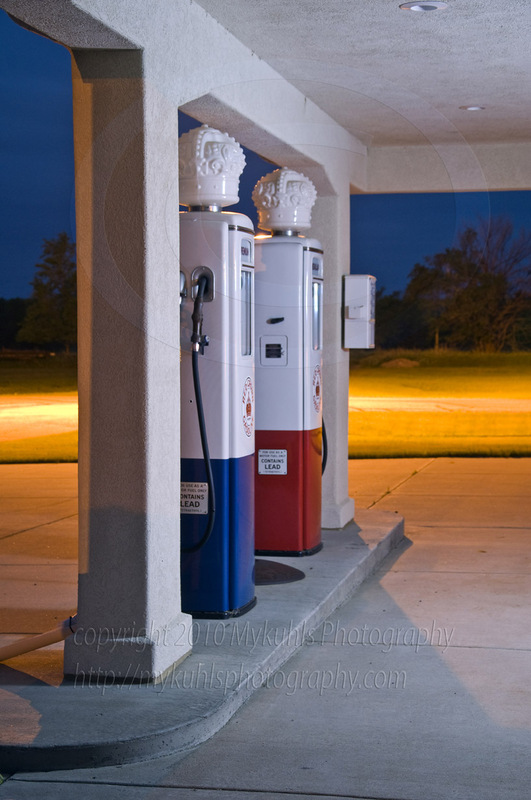 The gas pumps that I can barely remember from my pre-driving days. How far back does your memory of these corner icons go? I love it when cool people whom I love get together to make something remarkably memorable. Kirk, whom you met here on ND365 in April is not only just a tattoo master, but a very gifted artist. I wish I could just sketch anything similar to what he does all out! 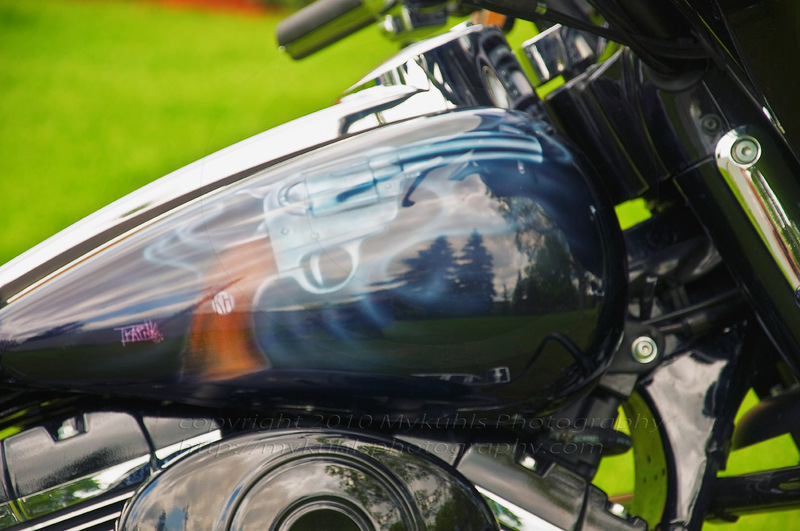 This revolver on the gas tank belongs to another friend whom I love, Krystal Haibeck. She’s a fireball, a pistol in her own right, a hunter, a marksman and a hard-working construction worker. These two collaborated to do a design on her bike that is a trophy winning design. I wear some of Kirk’s ink, not only on my body, but on vests he has airbrushed for me. 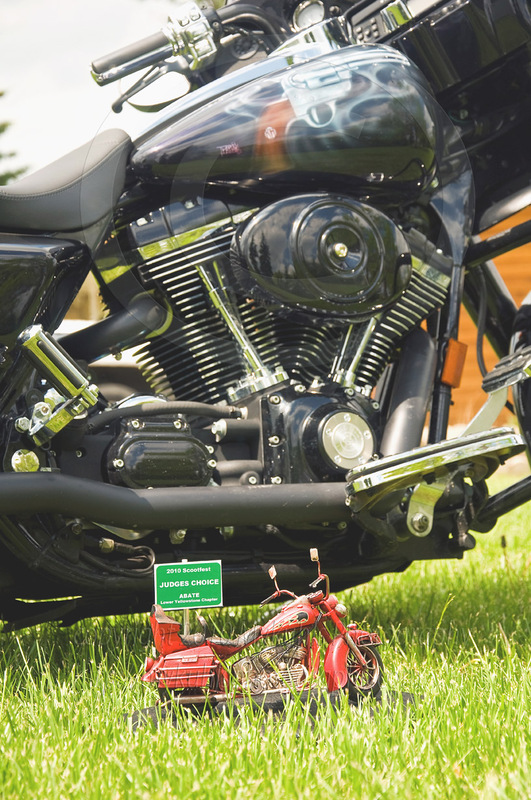 This work on Krystal’s bike is testimony that you can trust him with your work. I want more. Wanna know more about Kirk? How to reach him? Leave a comment here and I’ll get back to you. Yesterday it was the Patriot Guard Riders honoring returning soldiers. Today, it is the Second Brigade Motorcycle Club honoring all vets but especially those in the First Brigade, our peers who served in Vietnam and were not well received when they returned in the 60’s and 70’s. (There was no Patriot Guard Riders in those days.) 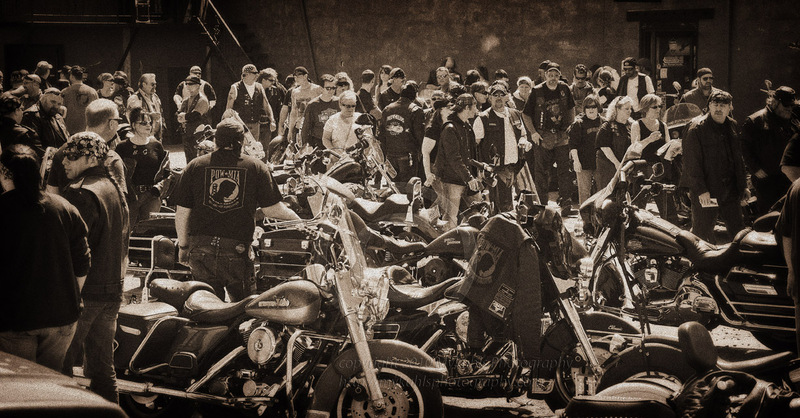 That generation is honored these days by clubs such as the Second Brigade Motorcycle Club, Vietnam Vets motorcycle club and Legacy Vets motorcycle club. On this day, May 15, all who served were honored in the annual Armed Forces Day ride, and it would appear that there may be hope for the next generation to honor veterans as well. 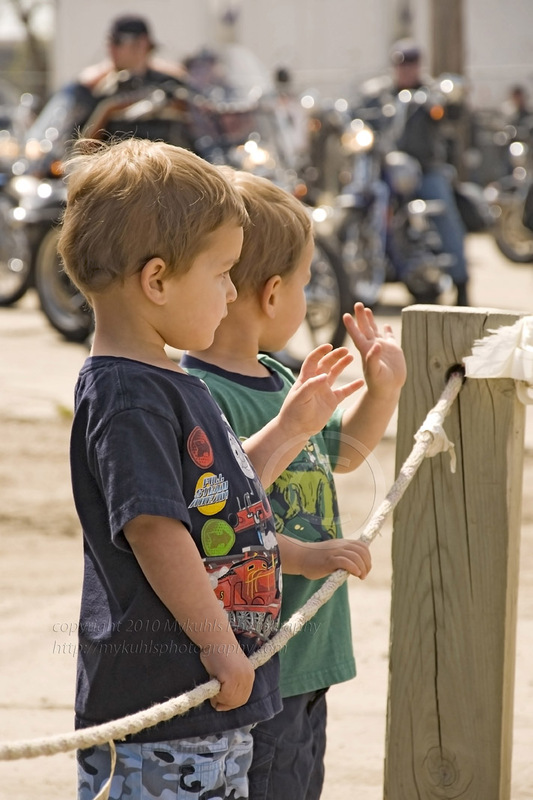 A young pair of boys waved and saluted as the riders started their ride. Personally, I found it very touching. 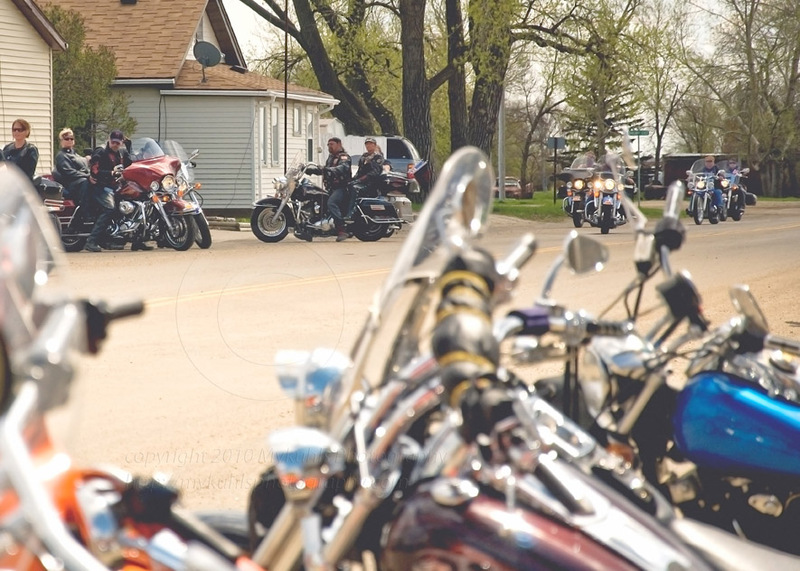 The day was perfect for a spring ride and so more than 100 riders covered Burleigh and McLean counties on their fun run, a ride of fellowship and of fundraising. They hit Washburn, Mercer, Wing and ended in Bismarck where they started. 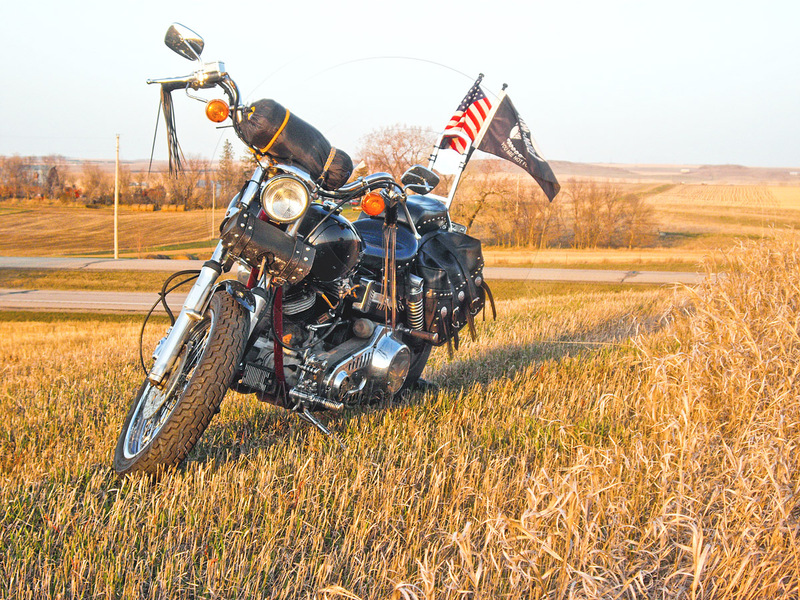 The day was not only about remembering vets and socializing, it was also to raise money for the POW/MIA monument to be erected at North Dakota’s Veterans Cemetery at Mandan. By day’s end, nearly $3,000 was raised in the fun run, the silent auction and a large personal contribution from the owners of Lucky’s in Bismarck where the ride ended. 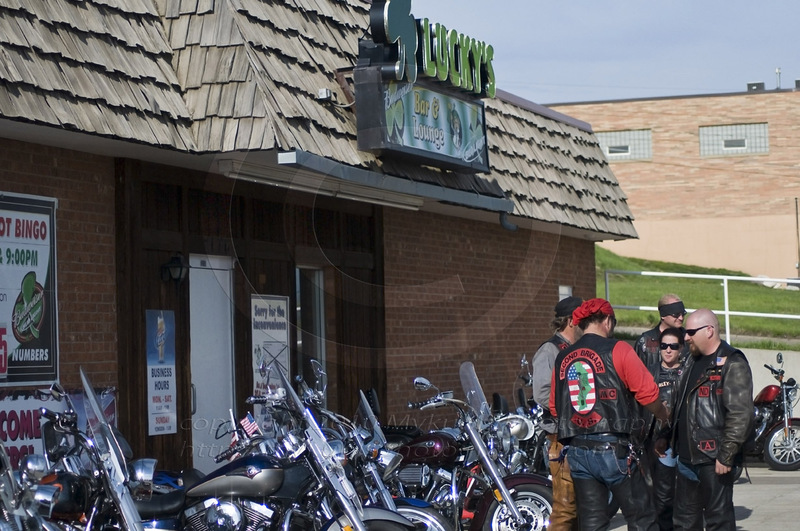 I don’t know if this is just a local phenomenon or if it’s happening elsewhere, but I know in the Bismarck/Mandan area veteran and military support motorcycle clubs are becoming more visible and more popular. What do you see in your area? 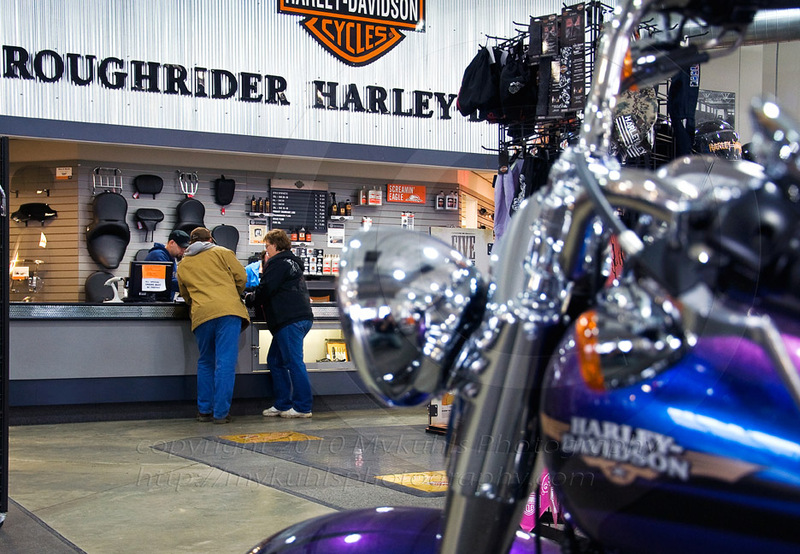 One of my favorite places to hang out, even drink a cup of well-cooked coffee while visiting and browsing — Roughrider Harley-Davidson in Minot. I’ve done business there for years, even back before it was Roughrider. Folks like Kevin back behind the counter have done a lot of good things for me and my old 1978 fxe with a shovelhead engine and my 2005 Road King with a twin cam. So, it’s only natural that I’d still visit there and check out the new models, the new accessories and the new clothing. This chameleon HD in the foreground, as you can tell, changes colors depending on how the light hits it. Walk around it one time and you’re not sure if it’s blue, burgundy or black. I love my old bike and as you know, if you’ve seen any of my more recent entries, I’ve been using it as a model these days. 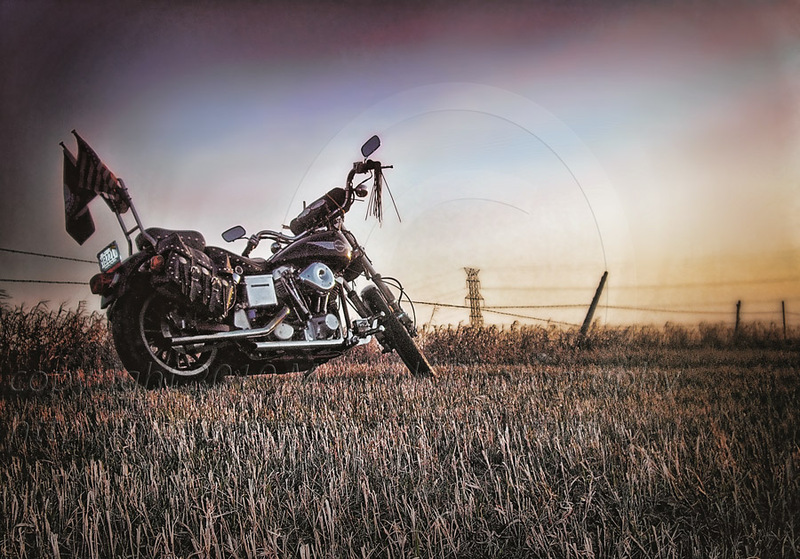 Here in a stubble field, overlooking Hwy 83, north of Bismarck, the bike looks good. I will be sad to part with it, but I actually took this photo for a want ad. However, it doesn’t have the romantic glow about it that something like this would have. It’s a 33-year-old scooter, so if one puts a little romantic imagination to it, it can look more like this. I wish I’d not put the copyright logo on top of the vignette like I did, but oh well. It makes the vignette look too stark, too well-defined. So, one more Photoshop alteration just for the heckuva it.